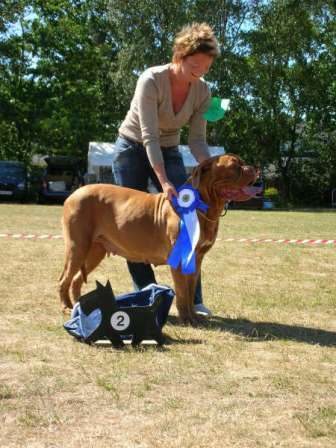 Today we went to the Danish Breeder Clubs summer show in Kastrup, Vordingborg. It is our lokal department of the breeder Club and they made a nice show. We went there with Mille and Sara. It was sara's first show and she was very nervous in the ring. But everything went fine and we have had a very nice day. Sara became very good and Mille went allmost the whole way to the top. She became BIS 2. See Sara's critigues here and Mille's here. 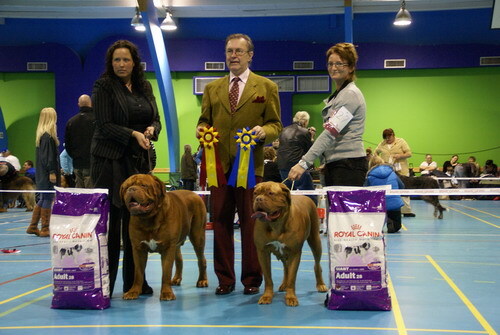 This weekend we went to the Danish Dogue De Bordeaux Club's christmas show in Næstved. We decided to enter with Mille in the open class. It was Mille. 's 2nd show. We had a very nice day together with Smydi (Kennel I am Smydi’s) and Marie (Kennel Estephe) and Mia. Specially because Mille became Best Female and afterwards became BOS. Meeko became Best Male and BOB. We were very proud since it was the parrents to our A-litter. Meeko BOB (Left) and Mille BOS (right).